As promised, here is my in-depth review of the free Kutoa Bars I received via an Instagram giveaway! If you haven't seen my unboxing video of it yet, check it out here. Fun fact: This was the first giveaway I've ever won, so I was really surprised and excited! I was extremely pleased with these bars, and if you like this sort of post (featuring a healthy food unboxing and then a review), I'll do more in the future! I must admit, this company is quite impressive. 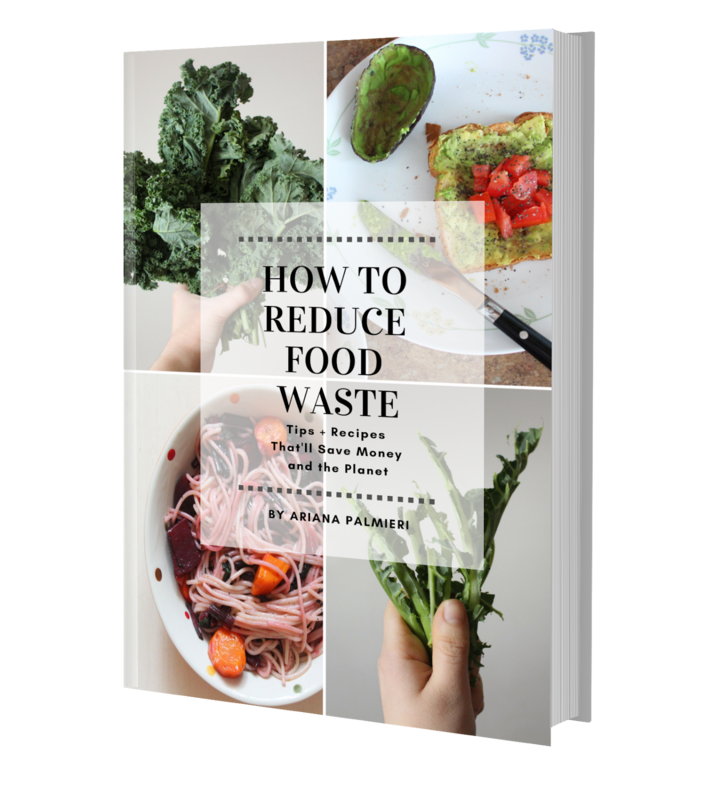 It was founded by a young entrepreneur, Joey Grassia, back in 2009 who was appalled by what malnutrition could do after time spent in South Asia where it was common for children to go to sleep hungry. He had his own health scare too: Despite his intense workout regime and strict calorie intake, he was getting severe migraines and sharp pains in his chest. The cause of his illness stemmed from his high intake of unhealthy processed foods. After seeing a doctor, he realized he couldn't take his health for granted anymore. According to Grassia, "without our health we have nothing". 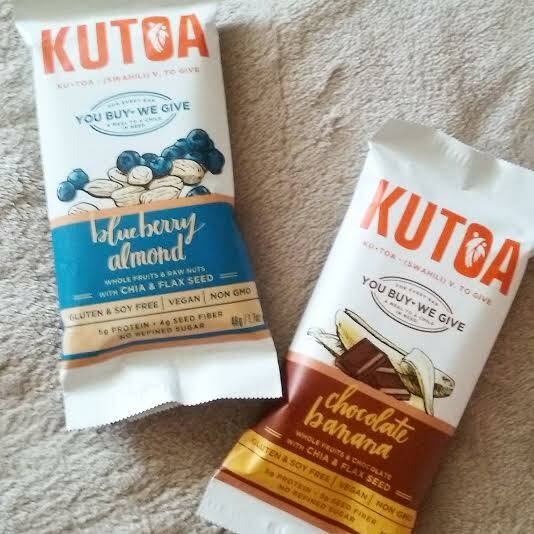 It was on this motto that he founded Kutoa Bars - he was dead set on not only providing a healthy snack alternative, but also on a mission to help starving children in undeveloped countries. And boy, did he! His company is outstanding: For every bar you buy, Kutoa feeds a child in need. Great right? Kutoa reaches children all over the world, from developing countries to children living in the united states. From micronutrient packs for infants to healthy sandwiches for older kids, Kutoa provides healthy food options for each child according to their age, location, and specific dietary needs. They have given over 500,000 meals to children in need to this day. That's certainly more than I ever have (unfortunately). These bars are all natural, vegan (but you don't have to be vegan in order to love them - after all, I'm not vegan! 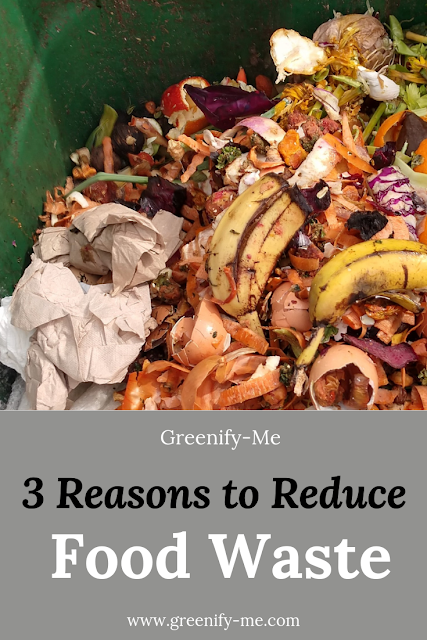 ), dairy free (perfect for anyone with lactose intolerance), gluten/wheat free, non-GMO (because who needs genetically modified ingredients in their food? ), and soy free. Not to mention they're also made with no preservatives and no added sugar. Pretty sweet huh? Each bar has a healthy, balanced mixture of nuts, whole fruit, chia seeds, and flax seeds. Chia and flax seeds are powerful superfoods too - something you should eat as often as possible - and these bar makes it nice and easy to do just that. Note: These bars are a great aid in digestion, so be prepared - you might need to use the restroom if you eat more than one! Why you want it: If you love chocolate covered bananas, but crave a guilt-free version of it, this is your new go-to! My review: This flavor was my absolute favorite out of both of them. The other one was definitely yummy, and totally worth trying, but this one was gone very quickly. I received at least 12 full sized bars in this box, and now I only have one left (not to mention my parents loved them)! I'm a sucker for chocolate, and it really did taste like a chocolate covered banana. The texture of the bar was soft and chewy, and just a tad crunchy here and there (I blame the nuts- not like I minded). There weren't any actual chunks of banana or chocolate chips in it either.Instead the ingredients inside the bar were blended and ground up pretty well. However, the bar was not over-processed at all: You can clearly see and feel that as soon as you open the package, which I really liked. 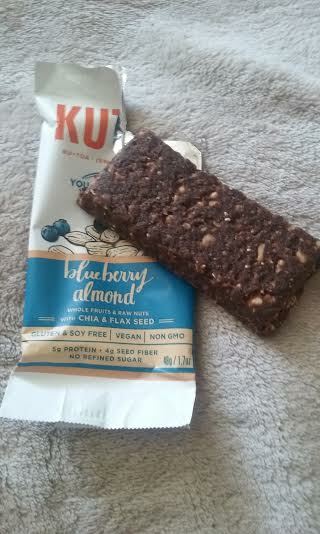 It gave it a raw, all-natural feel I don't see in most snack bars (aside from granola bars - but those aren't nearly as soft and chewy as these). The chocolate taste wasn't overpowering though, and neither was the banana. It mixed together well and balanced each other out, creating a unique taste all its own. Unfortunately, the ingredients on the box were a little different from the ones listed on the site, and the packaging was different from the pictures on the site. While these were minor issues I had with these products, it did make things a little confusing. I'm not sure if they just didn't update the pictures/ ingredients on the site yet, or if they made a separate batch just for me, which is a little misleading. Thankfully though, the products on the package weren't so outrageously different from the ones on the site - if they were, I'd consider that a bigger problem. Below, I'll list both the ingredients on the package and the website so you can see for yourself what I mean. I didn't think this was too big of a deal, but I did find it weird (after all, why change the ingredients/ order of them just for one person, you know?). Despite this, I really liked these bars and can totally see myself purchasing this flavor in the future! Why you want it: If you like subtle hints of blueberry with a slight nutty after taste, this is for you. 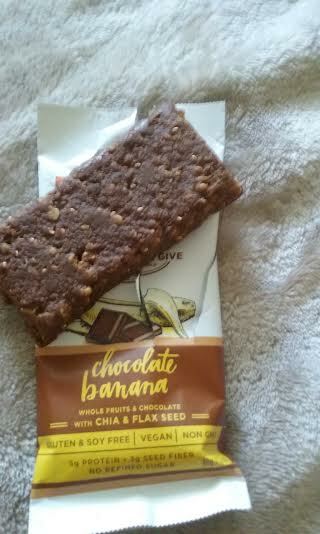 My review: As much as I liked this bar, it couldn't compare to the chocolate banana one for me. I was a little disappointed with the taste - I was hoping it would be a little more bold and distinct. While the chocolate banana bar was subtle in taste too, this one was even more subtle. I would have liked to taste the blueberry a little more. Every once and a while I would taste the blueberry a little more strongly, which was always pleasant, but I wish I would've tasted it more consistently. I didn't really taste too much of the almond either, but I could tell it was in there because this bar had a more nutty texture to it when I bit into it than the other. In a way, i tasted the dates a little bit more than anything else( I didn't mind- I like dates)! However, the texture (chewy and soft) was the same as the chocolate banana bar and it really pleased my palate. I don't like it when bars are too hard and crunchy (like granola bars) because then they fall apart and get all messy. This was nice and easy to eat, and similar to the other bar, highly unprocessed. Unfortunately, just like the chocolate banana bars, the ingredients on the box were a little different from the ones listed on the site, and the packaging was different. While these were minor issues I had with these products, it did make things a little confusing. I'm not sure if they just didn't update the pictures/ ingredients on the site yet, or if they made a separate batch just for me, which is a little misleading. Thankfully though, the products on the package weren't so outrageously different from the ones on the site - if they were, I'd consider that a bigger problem. Below, I'll list both the ingredients on the package and the website so you can see for yourself what I mean. Aside from that, I'm grateful for getting to try this product for free and really wish there was a Kutoa store near me! On package: Dates, Gluten Free Oats, Brown Rice Syrup, Organic Pea Crisps (Organic Pea Protein, Organic Rice Flour), Blueberries (Blueberries, Apple Concentrate, Sunflower Oil), Brown Rice Powder, Almonds, Brown Rice Protein, Flax Seeds, Organic Chia Seeds, Vanilla Extract, Sea Salt. 1) Each bar had a unique taste and texture. 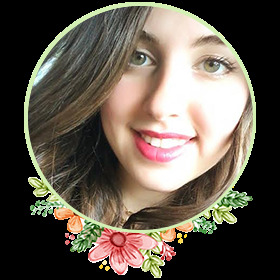 2) Definitely lives up to its values and standards of being vegan, all-natural, etc. 3) Were a healthy alternative to other snacking options. 4) My friends and family really liked them too. 5) I really admired Kutoa's humanitarian ethics and would gladly support buying from them in the future. 1) The ingredient list on each box was different from the ingredient list on the website, but only by a few ingredients/ order of ingredients. 2) The packaging was different from the one on the website (not that important, just a bit misleading). 3) The blueberry bars could have been a little bolder in taste (again, minor con). Conclusion: I'd totally purchase one of these flavors (probably the chocolate banana ones) in the future - or else my mom just might do it for me!